Your weekly guide to how East Antrim-based teams fared in the Ballymena and Provincial League. Intermediate Division: Rathcoole pushed second-placed Newtowne all the way at the Diamond but came out on the wrong end of a 4-3 scoreline. Aaron Lindsay got the Newtownabbey side off to a flyer when he scored inside the first 60 seconds before Glenn McCord doubled their advantage with just 10 minutes on the clock. The shellshocked visitors took a while to get back into the game but they pulled one back through a Rory O’Reilly penalty on 40 minutes. And on the stroke of half-time Ryan Twist scored to level matters at the break. Rathcoole edged ahead again on 63 minutes through Adam Irwin, only for Jonny Duddy to restore parity. The winner came courtesy of an 83rd-minute Billy Dorans goal. Junior Division One: After the disappointment of defeat to Antrim Rovers a week earlier, Woodlands bounced back in style with a thumping 7-2 win over Desertmartin Swifts. An Alex Haggan hat-trick, a double from Thomas Ogilvie and a goal each for Ross Oliver and Paul Addis made it a comfortable afternoon for the Carrick outfit. Carnmoney FC bagged a 3-0 victory at Cookstown RBL thanks to goals from Matty Wray, Jonny Reilly and Craig Montgomery. Junior Division Two: Dean Meneely, Lee Lowry and Jackson Griffith were all on target in Krag Albion’s 3-1 win at Remo. Ballyclare North End were edged out 2-1 by Wakehurst Strollers. The Ballymena men drew first blood through Paul Gilchrist before Nathan Robinson levelled. But Philip Cunningham’s 70th-minute proved crucial for the Strollers. Junior Division Three: Carnlough Swifts landed their first league win of the season with a 4-1 success over Rathcoole Reserves. Declan Diamond got the ball rolling for the Swifts before Brendan McDermott’s double put them three goals to the good. Rathcoole pulled one back but it was to be Carnlough’s day and McDermott went on to complete his hat-trick to put the gloss on a memorable victory. Mallusk Athletic Reserves emerged as 4-3 winners over 3rd Ballyclare. Mallusk were 3-0 up at the break thanks to Andy Brownlee, Phil Browne and Michael Frew. 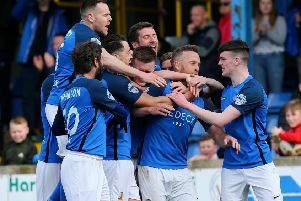 The Old Boys hit back in style through Steve Howe, Marc Campbell and Stuart McConnell but Mallusk had the final say with Jason Stirling’s 88th-minute winner. Aaron Bickerstaff, William Cushley and Craig Irvine were among the goals as Mountainview eased to 3-0 win over Red Star. Canada Trophy (R3): Whitehead Rangers lost outto Newington YC II who scored twice without reply. Ryan Davidson and Daniel Moore got the goals.